Taking a dip in a pool is a great way to beat the summer heat, but for some of us the pool contains a toxic cocktail. The swimming pool has provided a haven from the heat for generations of Australians. Springing up in towns and backyards in the '60s, the pool offered a healthy alternative to polluted beaches and waterways. The smell of chlorine became a part of Aussie life, and swimming became part of the national psyche. But the very thing that makes pools healthy for many – chlorine-based disinfectant – makes it a potential health hazard for others. Chlorine-based disinfectants (hypochlorite, chlorine and chloroisocyanurates) inactivate a wide range of water-borne pathogens. But when these chemicals react with organic matter such as urine and sweat, chlorine releases a mixture of by-products that can irritate the eyes, skin and upper airways. Recent research by Belgian scientists published in Pediatrics has added to the theory that chlorine in swimming pools can increase the incidence of asthma, allergic rhinitis and hayfever in those who are vulnerable to allergies. The researchers examined 847 students between 13 and 18 years of age who had been swimming in indoor chlorinated and unchlorinated pools. They found that children who were allergy sensitive were more likely to develop asthma and other allergies if they swam in chlorinated pools. Those who spent more than 1000 hours in chlorinated pools were up to 14.9 times more likely to have asthma and 3.5 times more likely to have allergic rhinitis. Children who were not allergy sensitive or who had swum only in pools solely disinfected with copper or silver ion-based sanitisers did not display asthma or respiratory symptoms. For many years, swimming has been recommended for people who have asthma because the humid air is less likely to trigger a wheezing attack. In fact, about a third of the Australian Olympic swimming team reportedly have asthma. So does this research spell the end of summer fun and kill Olympic dreams for people with asthma or allergies? The cross-sectional study shows children who are more prone to allergies can develop asthma, but it is still unclear as to whether or not it is directly related to chlorine exposure, says asthma expert Professor Guy Marks from the Woolcock Medical Institute. "The science around this isn't sorted out. I'm not advocating against swimming, but there is a watching brief on this issue," Marks says. While still too early to give "concrete advice", he says it does indicate care needs to be taken. "It would be better to avoid indoor pools, particularly ones that are heavily chlorinated, particularly in children who have a predisposition to asthma or allergies," says Marks. This is because children who are allergic are at much greater risk of developing asthma and they develop a type of asthma that is more severe and more persistent, he explains. Also it's not just indoor pools that are an issue, say the researchers, who previously found that asthma risk also increased in outdoor chlorinated pools. "The respiratory impact of chlorinated pools can be assessed correctly only by taking into account total exposure to chlorinated pools, regardless of the type of pool and the conditions of attendance," they wrote. But it is almost impossible to avoid chlorine if you swim in an Australian pool – especially if it's a public pool that uses treated water – as state health authorities require these pools to use chlorine or bromine at specific levels. Pools primarily disinfected using copper or silver ion or ozone-based systems are still advised to use chlorine to ensure dangerous micro-organisms are effectively controlled. Even salt-water pools are not chlorine free as salt is converted into chlorine by the generator. So to minimise irritants in your pool it is important to maintain it at the correct pH and free chlorine levels and keep organic matter to a minimum by regularly vacuuming the pool, cleaning filters and ensuring high water circulation. But despite the asthma risk associated with chlorine, pools do need to be effectively sanitised. Poorly maintained pools with high levels of organic matter can also cause major health problems when water temperatures are higher, particularly in summer. Inadequately sanitised swimming pools and spas have been shown to cause significant illness and even death from pathogenic microorganisms. During summer, pool and spa owners are urged to to closely monitor chlorine and pH levels to ensure home pools are not infected with waterborne diseases that thrive in water temperatures between 28 to 40 degrees Celsius. Sometimes however, waterborne diseases can survive despite chlorination, especially in public pools. In 2009, cryptosporidiosis (a digestive tract illness caused by a parasite called Cryptosoporidium)hit a ten-year high in NSW. Shower yourself and your child before swimming. 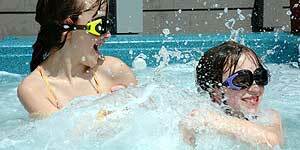 Do not use the pool if you or your child have had diarrhoea or a gastrointestinal infection in the previous week. Do not change your child's nappy by the side of the pool. Dress toddlers in close-fitting swimsuits to better contain faeces and occasionally check their swimsuit for faecal discharge. Reduce the risk of accidents by taking children for frequent trips to the toilet. Do not rinse your hands in the pool water after a trip to the toilet or after changing your child's nappy. Use warm water and soap.